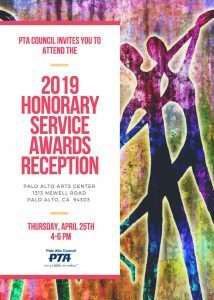 Each year the Palo Alto Council of PTAs may bestow one of several California State PTA Honorary Service Awards to individuals or organizations that have demonstrated outstanding service to children and youth in our community. The individuals or organization nominated must make far-reaching, notable contributions. The PTA Council HSA Committee selects persons or groups who have benefited children and youth on a district-wide or Palo Alto community level. We also have awards that honor exceptional PTA volunteers at the unit (school) level.